Tired after a hard day’s work? Craving some good food, but don’t feel likeeven lifting a finger? Don’t you wish someone would just hear you and make your wish come true? 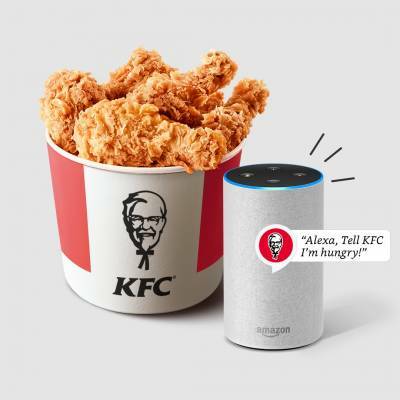 Well, would you believe us if we told you that you can now call outyour favorite finger lickin’ good KFC and Alexa will make it happen. We kid you not! It’s time to change into comfy sweats, settle into your lazy bean bags and order that big bucket of crispy juicy goodness.To start ordering KFC on Alexa, all you have to do is enable the skill from the Alexa app and say “Alexa, start KFC”; “Alexa Launch KFC”; “Alexa tell KFC I am hungry” and you’re in for some finger lickin’ good surprise. So, sit back and dig into your treat as KFC and Alexa make ordering food at home easier than ever. With this alliance of food and technology, KFC India becomes the first QSR brand in the country to associate with Alexa for online ordering. “As users get accustomed to engaging with Alexa, they look for new ways to embrace voice technology in their daily experiences. The ease of ordering food with just a few voice commands can be very convenient”, said Dilip R.S., Country Manager for Alexa Skills, Amazon India. “We are excited that Alexa users can now order their favourites from KFC in a few minutes with this new skill”, he added. Through Alexa, consumerscan now place a hands-free Cash on Delivery orderwithin the KFC delivery radius.The KFC skill can be experienced across all Amazon Echosmart speakers as well as a range of Alexa built-in devices such as Harman Kardon Allure. Wait no more, try your voice and order KFC through Alexa today. Step 2: Sit back and command - “Alexa, LaunchKFC”. Your KFC skill is launched. Step 4:Sit back, relax and enjoy your meal. It’s as easy as it gets!